Every year each charity is required to complete and file Form T3010, Registered Charity Information Return, within six months of the fiscal year end of the charity. No extensions are given. Failure to file the T3010 on time is cause for the charity to be de-registered and subject to a $500 penalty as a re-registration fee. Re-registration is not guaranteed. The T3010 is generally used to confirm compliance with the provisions of the Income Tax Act. Canada Revenue Agency (CRA) has produced guide T4033, Completing the Registered Charity Information Return, to assist charities in completing the T3010. 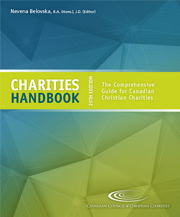 The guide is intended to comment on issues frequently raised by charities in preparing the T3010. Portions of the completed T3010 for each charity are available on CRA's website for inspection by the public. If the registration of a charity is revoked, the notification provided by CRA establishing the reasons for revocation will also be provided to the public. 4: May we change our organization’s fiscal year end? 27: When should an amount paid by one charity to another be treated as a gift and not a grant?